This is an archive of case update letters mailed out by Redwood Summer Justice Project over the years leading up to the trial in Bari vs. FBI. If you are unfamiliar with the case and want a detailed view of the development of it, you might want to start at the bottom of this index with with the earliest updates (written by Judi herself) and work your way up. 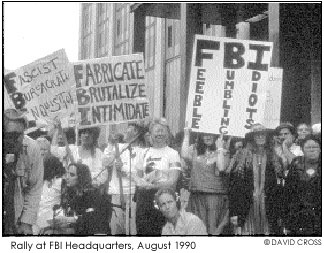 The trial in Earth First!ers Judi Bari and Darryl Cherney’s civil rights lawsuit against the FBI and Oakland Police (OPD) begins October 1, 2001. Here is an update of what we’ve been doing on the legal front to get ready. "... For more than two decades, Mr. Blanton and Mr. Cherry evaded indictment and prosecution because the FBI held back these recordings. This was evidence we desperately needed in 1977 — evidence whose existence FBI officials had denied. Had it been provided in 1977, we could have convicted all three of these Klansmen." Click here for the complete letter as a normal web page. Click here for the complete letter as an Adobe Acrobat PDF file for online viewing or printing out in original format.